We present to you, the best Mother’s day gift- tips! If a woman about 90 years old have been indoor skydiving, my mother at the age of 101 can do it as well! Mother’s Day: This special day is coming on! Time to find an original gift for your mother. Would you like to surprise her this year with an original Mother’s Day gift? Then you’re at the right place at Indoor Skydive Roosendaal. Because we have some great Mother’s Day gift ideas! We know the struggles and have the solution for you ….! Every year, it’s a good fight to find a nice gift for your sweet mom. A high tea, breakfast on bed, bath foam or perfume are nice Mother’s Day presents, but maybe a bit boring. But have you ever thought of surprising her with an original Mother’s Day gift? Of course, with an original gift, we mean something exciting and something that is absolutely unforgettable and unique! 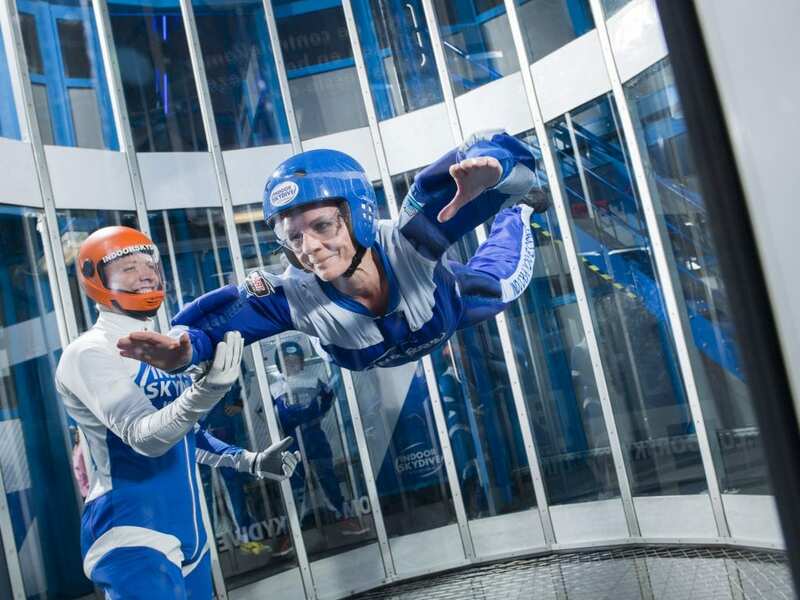 Give your mother the experience of indoor skydiving as a gift. Do not miss this opportunity and let your mother experience the unique free fall experience in our wind tunnel in Brabant. Without having to jump out of an airplane! Indoor skydiving gives your mother a huge adrenaline boost and certainly gives her an unforgettable experience! Choose for at least four, five or six indoor skydive sessions. At the first three sessions the focus is mainly on working on the right attitude and stability in the tunnel. At four sessions or more, it starts to be fun. Then she learns to fly in all directions. Great chance that your mother flies in the arms of the handsome indoor skydive instructor at five or six sessions! Give an original Mother’s Day gift! So do you want to give a truly original gift once for Mother’s Day? Give her a indoor skydive gift! Check out all the prices and order your indoor skydive tickets online!